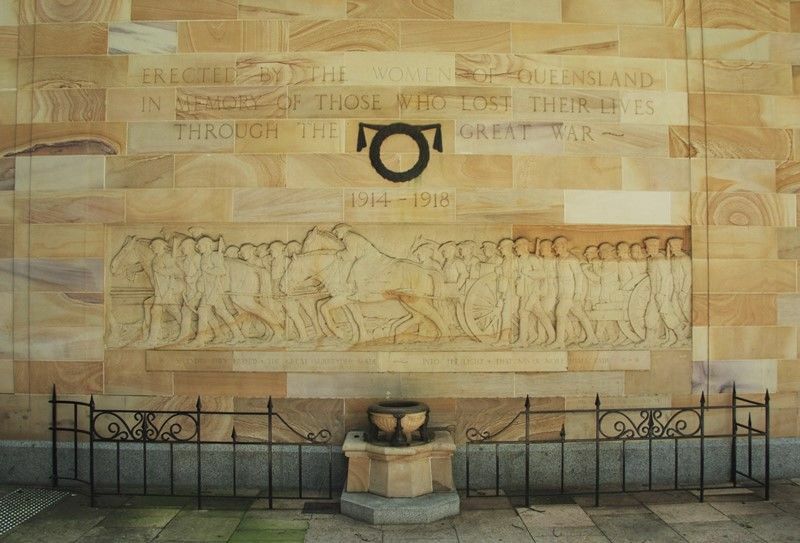 The Womens Memorial was erected by Queensland women in memory of the fallen of World War One. 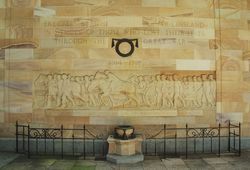 This memorial which is sculptured on the western wall of Anzac Square takes the form of a sculptured panel of infantry and horse drawn guns. In front of the memorial there is a sandstone drinking fountain supported by four bronze fish. During the late 1920's the Brisbane Women's Club came up with the idea of contributing to a State War Memorial. They appealed not only to women's organizations throughout Queensland but also to women in general, to support the idea. In 1929 they awarded the commission of the memorial to female sculptor Daphne Mayo. The memorial was unveiled by Lady Goodwin on the 24th March 1932. In May 1930 at a meeting held in Anzac Square, the Lord Mayor said the proposal of a Women's Memorial had the full support of the Anzac Memorial Committee. The idea of the memorial had started as a tribute from the women of Queensland and the practical idea of fountains with facilities for drinking water had been chosen. Donations of one shilling from many women in Queensland as possible were required to make it possible to carry out the scheme with the objective being 10,000 shillings. Daphne Mayo outlined her design at the meeting.